(Allentown, PA – April 2, 2018) — Creative Colors International (CCI), the nation’s leading on-site repair and restoration franchise, launched its newest location on April 2 in Pennsylvania’s Lehigh Valley. This is big news as more local business owners and cost-conscious residents than ever before are seeking out alternatives to astronomical upholstering charges and replacement fees associated with damaged possessions that are made of leather, vinyl, plastic and fabric. Brothers Anthony Cruz of Bethlehem and Rolando Cruz of Easton have joined forces to realize a childhood dream to run a family business together and bring mobile on-site repair and restoration to Lehigh Valley communities. They spent the last 18 years working in the automotive industry as service providers as well as in parts warehousing and delivery. They also spent their childhoods working on sports cars with their dad, so working on cars has always been a passion. So, Anthony Cruz says going into business with Creative Colors International (CCI), the nation’s leading on-site repair and restoration franchise, was a perfect fit as it allows him and his brother to work together, with their hands, in the automotive industry. The Cruz brothers plan to start with one mobile van and target automotive dealerships but then grow from there serving restaurants, offices, and casinos. Their plan is to add multiple vans to their fleet in the next 3-5 years. 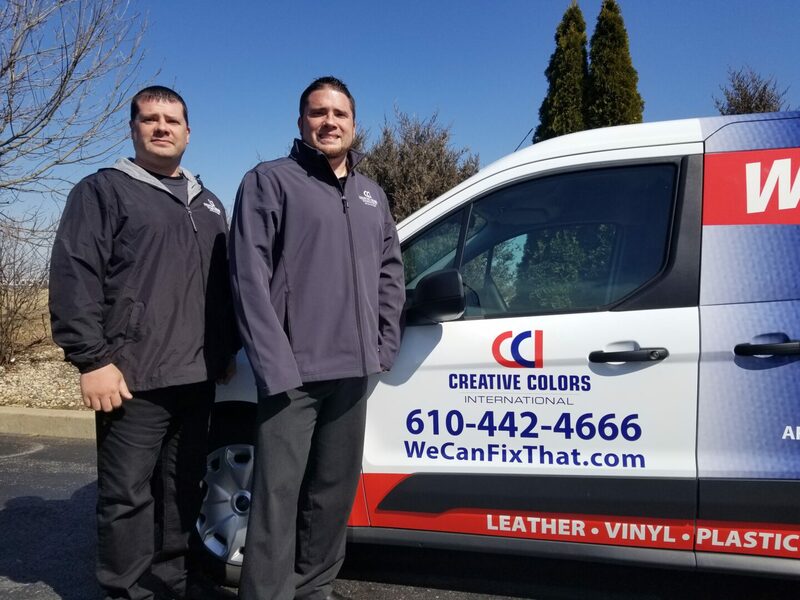 The Cruz brothers believe businesses in the Lehigh Valley will love the company’s revolutionary products and restoration techniques that will help local customers save up to 90% in replacement fees by repairing worn and/or damaged materials. The statistics suggest that repairing and restoring, as opposed to upholstering and replacing, can save local business owners and residents hundreds of dollars on any damaged item. For example, the costs associated with upholstering any type of seat can be very steep, ranging anywhere from $120 to $450 per cushion. And according to Terri Sniegolski, Creative Colors International’s CEO, the commitment shared by all franchisees to help customers save money, and deliver on the company’s “We Can Fix That” philosophy, has been the key catalyst for the company’s expansion to 82 locations in 28 states with 160+ mobile units since its initial inception in 1980. Serving the automotive, commercial and furniture industries, Creative Colors International offers affordable solutions for tears, holes, scuffs, scratches and other types of damage found on leather, vinyl, plastic or fabric through on-site repair, restoration, cleaning, dyeing and protection. For local residents, this means Creative Colors International can repair auto interiors, leather furniture, RV flooring, and boat vinyl, among other things. Additionally, for business owners, Creative Colors International can repair any upholstery found in critical locations around the company, such as waiting rooms, examination rooms, restaurant booths, hotel rooms, and theater seating, among others. For more information on the Cruz brothers and their Creative Colors International location, please visit www.WeCanFixThat.com/LehighValley. Launched in 1991, the Creative Colors International (CCI) franchise system was created through its affiliate, J&J’s Creative Colors, the original industry leader in refurbishment techniques and systems. Today, both companies continue to be family-owned and operated by the second generation. Catering to the abundance of upholstered items in every home, business and vehicle, CCI is the ultimate in on-site repair, restoration, cleaning, protection, and dyeing of leather, vinyl, plastic and fabric. Through proprietary technology, CCI restores damaged material at a fraction of replacement costs, saving customers up to 90 percent. CCI repairs are stronger than the original area and are nearly invisible to the naked eye. In the Automotive, Furniture and Commercial Markets, CCI offers on-site repair and restoration to all types of leather, vinyl, fabric, plastic and carpeting by repairing and redyeing holes, cuts, tears, burns, scrapes, fading and discoloration. For more information on CCI’s services and franchise opportunities, visit www.wecanfixthat.com.